It is now official: Central Intelligence Agency (CIA) confirms the existence of Area 51 in Nevada, USA. CIA released a 355-page document which also explained about the alleged UFO sightings in the area during the early years of US test flights of spyplanes. Are UFO’s Hiding in the Clouds? I’ve been asking the same question again and again since I encountered UFO-shaped clouds in the Metropolis in the past. Of course, I am aware of the different type of clouds in the skies such as cumulosl, stratus, cirrus, lenticular and others, but there are many times I could feel something weird about strange clouds. I sighted again another flashing bright object last night in the South Eastern horizon of Manila, Philippines. I took my 12 MP Camera and filmed the bright object and took some still shots. Of course you have different impressions or observations about the flashing bright object and i am not saying that this object is an alien craft hovering over metropolis though most people could see it as a UFO. You can post your comments or any suggestion about this flashing bright object. This is the fourth video i uploaded about this type of UFO Sighting. There are videos below about my previous encounters with these Flashing UFOs. If you have similar encounters kindly post your comments here or text Misteryo Philippines Network (MPN) us 09081217808/09179076847. Join us in the MPN Paranormal Community, sign-up in www.misteryophilippines.com. This is a series of shots taken in Manila, Philippines where an ET-shaped Cloud appears in the sky. What can you say about this manifestation? UFO? ET? Or anything what your mind could interpret about this image. UFOs Behind the Clouds? Why? Do you believe UFOs are hiding behind the clouds? Do you want to know my answer to this question? I answer “YES” though of course skeptic people could swiftly reject such notion, well this is only my humble opinion based on some personal accounts and the judgement is all yours and i won’t object to whatever statement whether against or for my suggestion. So why? What could be the reason these alien crafts are hiding behind clouds or they generate artificial clouds to hide themselves? It is a common sense, so we don’t have to ask them (aliens) about it….of course they just want to evade hostile reactions from humans especially if these UFOs are seen by the people. If you can observe the clouds up in the sky, you normally notice some cloud formations that are strange and you can even feel something is different with these clouds compared to the usual clouds. I am not referring to usual clouds we consider lenticular shapes or formed by storms or other weather systems, try to feel them, use your inner senses in distinguishing strange clouds from the normal. Based on many reports, photos and videos about strange UFO clouds worldwide, the everyday UFO-generated clouds can be classified as the Cumulus clouds. So we cannot differentiate the real Cumulus clouds from the UFO-generated clouds but we can just presume that UFOs create low level clouds because normally UFOs are low (hovering), low enough to be seen from the ground. These strange clouds are being observed worldwide especially those in the field of UFO sightings and investigations. In the fall of 1989, Russian Vitaly Kosinov says he was picking nuts when he suddenly was overcome with a feeling of great apprehension. “I felt as if someone or something was observing me. When I looked up, there was an odd dark-gray cloud hovering overhead. I fell to the ground, as if the energy in the cloud empowered me.” To this day Kosinov believes he may have been abducted but has no memory of it. In the late August 2004, Amateur astronomer John Bortle says he observe the cloud from his home in Stormville, New York, just after 9pm. “it remained in the sky for about 25 minutes.” Other observers described the cloud as a round dish, about the size of the moon. In December 2008, there was the strange “wheel” that looked like a large round hole punched in the clouds over Raceland, Louisiana. It was observed by a lot of people who called area police, television and newspaper offices. In the Philippines, I’ve been observing these strange clouds everywhere especially during daytime. One day I saw a shiny silver disk-shaped object in the Eastern horizon flying westward and it suddenly disappeared behind the clouds. Almost a year ago I saw an amazing strange cloud just above a local Carnival Park in CCP Complex, Pasay. I know and I could feel there’s something behind that enormous cloud similar to a mother ship. Misteryo DZRH on October 8, 2011 features UFO sightings and Extraterrestrial/Alien Encounters. Do you have dreams of meeting Extraterrestrial Beings? How do they look like? Or aware you were inside a strange craft? Do you always hear high-pitch sound in one ear? Do you believe you were being taken or abducted by ET Beings? Are you an alien contactee? What are the Extraterrestrial Messages? Misteryo listeners share their personal experiences. “Kapatid ko po nakakita. Nasa duty po siya nang makita yung isang bagay na kung ano. Ang laki daw po at nagbabaga at dahan-dahan daw pong bumaba. Ang kulay daw po ng apoy, pula at green, alas-10 daw po ng gabi nakita ng brother ko. Akala daw po niya yun ay meteor, nag-wish daw po siya kasi akala niya ay meteor katapusan daw po ng Agosto nakita ng brother ko, guard po siya, kukunan daw po sana niya ng picture gamit ang cp, kaya lang hindi daw po niya nagawa at natulala daw po siya pagkakita.” – Donna, Tanauan City, Batangas. “ano po kaya yung light sa gabi na parang star po, parang running star po tapos maya-maya po ay biglang lalaki yung liwanag tulad nung morning star tapos po ay biglang nawawala. Posible po bang ang Santelmo ay UFO din?” – Reymart Supleo, 18, Alma Villa, Gloria, Oriental Mindoro. “According to Erik Von Daniken’s book Gold of the Gods, isa sa purpose ng mga ET dito sa planeta natin ay an gating gold.” – Gerard of Dagupan City. 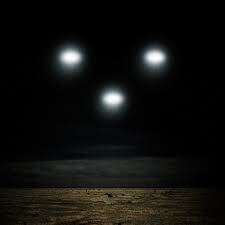 Recently, on September 20, 2011 there’s video about UFO Triangle Lights sighted in Novaliches. UFOs are classified as those from outer space or made by the extraterrestrials. But there’s a fact based on evidences that there are UFOs that are terrestrials in origin – made by man. The video here is a documentary proving that superpowers during the earlier times of aviation research have invented flying saucers but were highly classified and used only for special missions. Today, the flying saucer technology is used for the making of drones though there are speculations that militaries are using real flying discs in covert operations. 12 were skilled in various specialties. Steven Spielberg’s movie “Close Encounter of the Third Kind” was actually a re-enactment of the exchange program when a military personnel, who knew of the Serpo Project, imparted their knowledge to Spielberg. Serpo, is an Earth-size planet with a population of around 650-thousand alien beings known in UFOlogy as EBENs (Extraterrestrial Biological ENtity). An EBEN who survived the Roswell UFO Crash was said to have used a communication device to set up the exchange. This exchange program was exposed by a certain Request Anonymous. was involved in a special program. As for Roswell, it occurred, but not like the story books tell. second site at Pelona Peak, south of Datil, New Mexico. food. The entity was later transferred to Los Alamos. Roswell and then onto Wright Field, Ohio. site, the sheriff took photographs and then drove back to Datil. retrieved the bodies of their dead comrades. Information was exchanged.